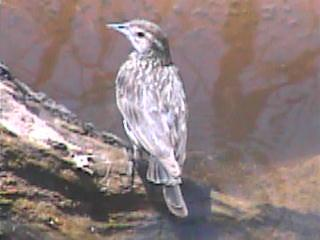 I thought this was interesting: the Bronzed Cowbird is on the edge of its winter range, more or less, so its prevalence at Welder might conceivably be affected by warming. 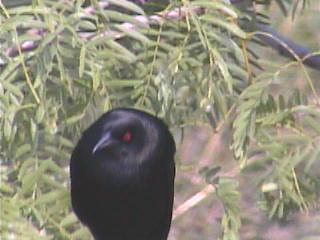 I wonder what the Christmas counts in Texas will show for the bird. Update: Here’s a graph from CONE Welder (much of which still works, making this a good time to probe through the data and images for interesting nuggets) showing classifications of Bronzed Cowbird by day since the camera went live. We’ve had at least one individual hanging around since early August, but I don’t know how unusual that is for Welder. I don’t know where or when that second photo was taken, but it looks similar-enough to Craig’s bird to make me wonder: could these actually be the same bird? 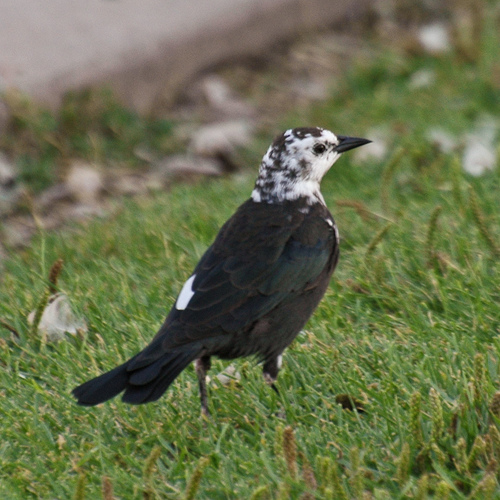 The pattern of white feathers is not exactly the same; Craig’s bird has some white feathers on the upper back that the Robinsegg bird doesn’t. But it seems just possible to me that that could be the result of the bird undergoing a partial molt during the time between the two photos being taken. And there are a couple of really striking similarities: both birds have a patch of brown feathers toward the back of the crown, and both have what looks like a large white feather in the flight feathers of the left wing. On the Robinsegg bird, it looks like it’s one of the left tertials (or maybe a secondary? 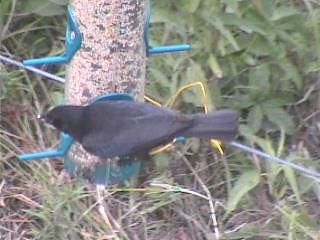 ), while on Craig’s bird it looks more like a primary. Though I suppose it’s possible that it’s actually a new primary, just growing in, in the Robinsegg photo. In truth, I think they’re probably different birds that just happen to look similar. But wouldn’t it be cool if they really were the same individual? 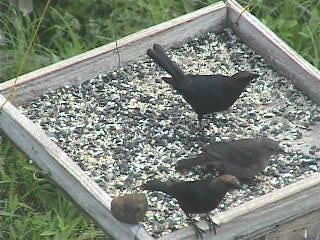 After Red-winged Blackbirds, Brown-headed Cowbirds are probably the most commonly seen birds in the birdcam; they’re pretty much always around. As with other icterids, the males and females are quite different. 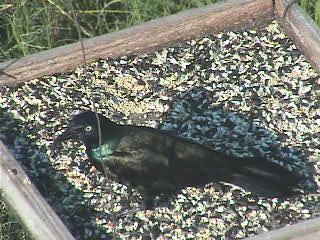 Males are black with a distinctive brown head, while females, which are similar in shape but just a tad smaller, are tan with few distinct markings. 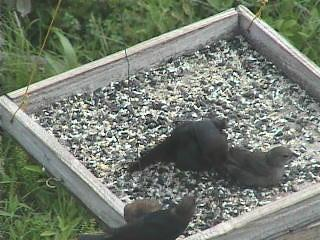 I took these three cowbird shots this morning because I thought it was interesting how the male toward the top of the frame was posturing; he did this several times. 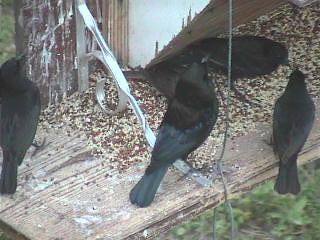 (The male at the bottom of the frame shows a more-typical cowbird posture.) 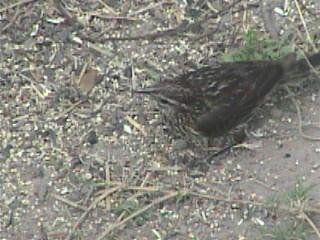 The female, too, seemed to be acting unusual, crouching down the way you see in these images. I wondered if this was courtship behavior, but no actual mating took place that I noticed. 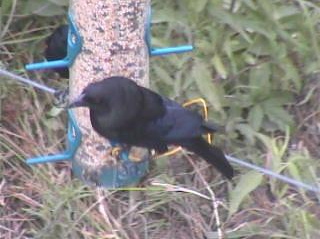 Brown-headed Cowbirds are nest parasites, as most readers of this blog probably already know. 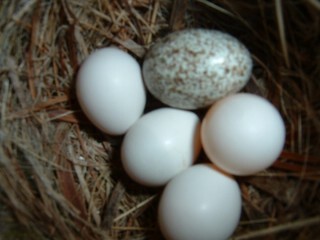 They don’t build a nest or rear their own young; instead, the female lays an egg in the nest of some other perching bird. I’ve read that as it matures, the young cowbird will often grow larger and faster than its nestmates, pushing them out of the nest to monopolize the attentions of its foster parents. According to that Wikipedia article, the cowbird’s nest parasitism evolved as an adaptation to the bird’s traditional lifestyle following the North American bison herds. With the arrival of European settlers and their livestock, they found themselves admirably adapted to the new conditions, and have continued quite successfully (in the eyes of some, a little too successfully) to this day. 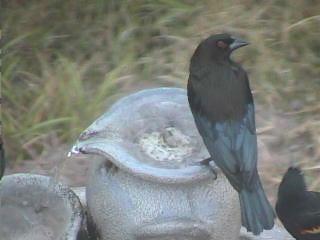 A bird that’s new for me with CONE Welder is the Bronzed Cowbird. 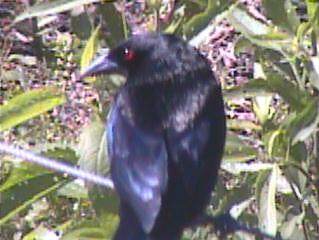 Like the other icterids in the system, the males and females look somewhat different, though with the Bronzed Cowbird the difference isn’t as obvious as it is with the other icterids we’ve been seeing. 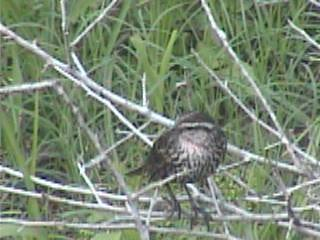 The female has the same pattern of black on the head and back, with lighter plumage below that, though the female is more drab than the male. Finally, here’s a good comparison shot I got back on May 4. 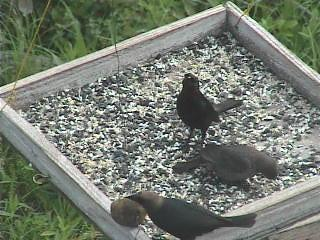 I think this shows a male Bronzed Cowbird in the middle, with a female on either side. (I’m not sure about the identity of the other two birds in the background.) Besides the difference in their markings, you can see that there’s a bit of a size difference between the sexes, too; the male is a little larger. 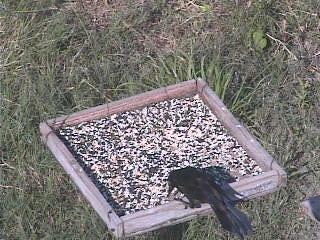 Blackbirds and grackles feature prominently in the birds we see in the CONE Welder camera. They’re pretty straightforward from an identification standpoint, but it’s important to realize that the males and females look quite different from each other. There are four icterid species that we see a lot of in the game currently, but to a casual observer they can look like eight different kinds of birds (at least). 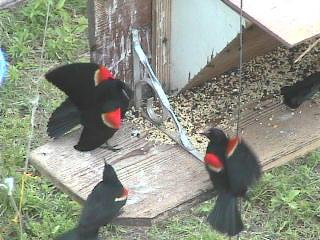 Some of us were chatting in the game the other day about how few of the female Red-winged Blackbirds were being successfully identified. I remember how, when I was twelve and visiting Florida for the first time, I spent days wondering what those “sparrows” were that were always hanging around with the Red-winged Blackbirds. 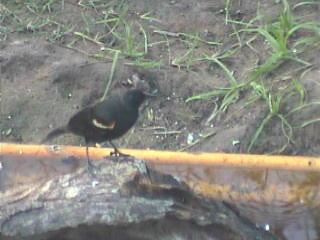 It wasn’t until I looked at my grandmother’s field guide that I realized they were actually female blackbirds. 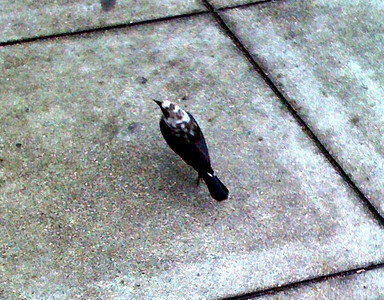 They’re superficially sparrow-like in terms of color and markings, but that long blackbird beak is a dead giveaway. You are currently browsing the archives for the Know Your Icterids category.